Agbor Nkongho: a lost opportunity for Cameroon Anglophone leadership? Cameroon has been engulfed in a major political crisis for almost a year - with massive civil disobedience, protests and political upheaval by a marginalized people in English-speaking parts of the country. As a result of the crisis internet connection in the affected regions were cut off on the orders of the government and many civilians were killed, disappeared, arrested and imprisoned. Some of those arrested, including Felix Agbor Balla, president of the banned Cameroon Anglophone Civil Society Consortium (CACSC), were released after about eight months in prison but since his release the civil society leader who was celebrated and admired by many before and during his arrest has been embroiled in pushback - with critics referring for him as a "traitor". What went wrong? 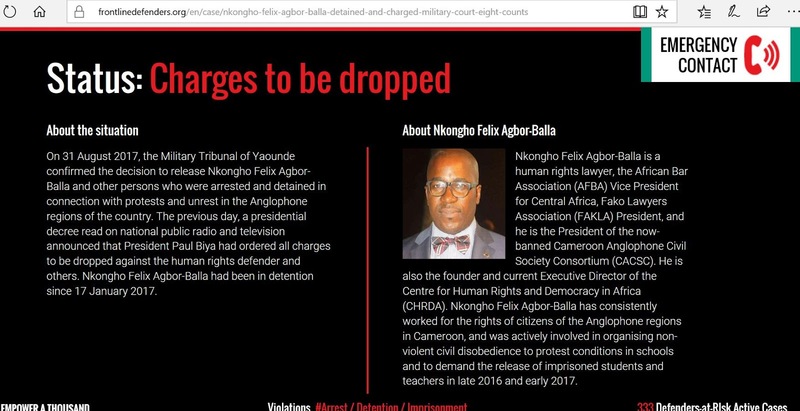 On August 30, 2017 Cameroon state media outlet CRTV reported that the president of the Republic, Paul Biya, had "ordered the discontinuance of proceedings" pending before a military court against Felix Nkongho Agbor Balla, barrister-at-law and leader of the banned CACSC, and some other persons who were arrested and charged with crimes including terrorism, secession, incitement to civil war, rebellion, amongst others in relation to the political crisis in English-speaking parts of the country. The release was celebrated by many as a turning point but celebration was short-lived as the masses realized that for starters not all detainees were released. The cautious enthusiasm surrounding the gesture of Cameroon's president of 35 years was further dampened by public utterances and statements made by the leader of the outlawed CACSC. In an interview on BBC Focus on Africa after his release the banned Anglophone civil society consortium leader called for resumption of schools and advocated for a federal system of government as a solution to the crisis. This is in conflict with the stance of other leaders in the struggle and their supporters who advocate outright secession and would like to see continuous pressure mounted on the government by way of closure of schools until the government releases all arrested persons and comes to the negotiation table in good faith - without preconditions. It is worthy to mention that schools have been closed in English-speaking parts of Cameroon since the struggle began in closing months of 2016. "Ghost towns" have been implemented for many days a week - with markets, shops and other businesses shut down for many days a week for almost a year. A long-standing strike action by lawyers, teachers and other groups in Anglophone parts of Cameroon persists. The massive civil disobedience is designed to force the hand of the government to address grievances raised by Anglophones who constitute a marginalized minority group in a majority French-speaking country. Barrister Agbor Nkongho and other Anglophones like Fontem Aforteka'a and Ayah Paul Abine who were arrested on, in my view, trumped up politically motivated charges and dragged to a military tribunal in violtion of international civil and political human rights standards that prohibit the trial of civilians in military courts were released partly as a result of pressure mounted on the government by protracted massive civil disobedience, including the closure of schools in English-speaking parts of Cameroon for several months. Their release from squalid detention conditions is welcomed. However, many other protesters such as Mancho Bibixy remain imprisoned hence the pressure on the government should continue until all arrested are released. The release of some is an indication that the current strategy works - and if it is not broken there is no need to fix it. The closure of schools was, in my view, perhaps the most impactful strategy intended to get the government's attention, and it paid off - with the release of barrister Agbor Nkongho, Dr. Fontem Neba, Rtd. Justice Ayah Paul and some other persons. Had schools reopened while Agbor Nkongho et al were still detained they, I reckon, would still be in prison facing trial in the military tribunal in Yaoundé. It is misguided and somewhat selfish for someone who arguably benefited from a strategy to come out of prison and almost immediately kick against it by calling for resumption of schools -- at a time when some other people who were arrested under same circumstances like him are still languishing in prison. In June 2016 when Agbor Nkongho and others were still in prison a renown Anglophone lawyer, barrister Sama Francis, called on lawyers to suspend strike action and return to work. At the time I argued in a blog post that Sama Francis was wrong because lawyers returning to work would amount to abandoning their colleague Agbor Balla and other Anglophones arrested in relation to the crisis in prison. Now that Nkongho is out of prison and is calling for resumption of schools I would argue the same: resumption of schools and a return to normalcy would amount to abandoning those left in prison. No political prisoner of the struggle should be left behind. According to an article on Fortune 6 principles made Nelson Mandela a renowned leader - one of the principles being anticipation. Mandela, according to the article assessed his moves while in prison and anticipated reactions hence when he was offered freedom in exchange for renouncing opposition to the government he said: "what freedom am I being offered while the organization of the people remains banned?... what freedom am I being offered if I must ask permission to live in an urban area?" He, Mandela, was prepared to serve out his sentence rather than exchange it for apartheid. This decision, according to an article on BIZNews elevated his position and drew attention to his sacrifice for the struggle. Now, I would be the first to admit that comparing Agbor Nkongho with Nelson Mandela - the most inspirational civil rights leader of all time in my view is a stretch. Asking Agbor Balla to, for example, stay in prison until the ban on CACSC is lifted or until all political activists, protesters and civil society leaders who were arrested in relation to the Anglophone struggle are released or until the collapse of marginalization of Anglophones in Cameroon is too much to ask because Nkongho is no Mandela. However, as a leader he should have at least strategically assessed his stance and anticipated reactions. He has not inspired as many people to follow him as he did before his arrest due to failure to anticipate reactions to a call for school resumption at a time when Mancho Bibixy and others are still imprisoned. Resumption of schools would mean a return to normalcy at a time when grievances have not been addressed. It is a lost opportunity when a leader in a struggle serves time in prison for a cause and becomes less popular after leaving prison. Some of the most renowned political leaders in history solidified their leadership in civil rights struggles after they were arrested and imprisoned in relation to their struggle. Some of the greatest political leaders, I would argue, were made in prison on politically motivated charges. Their stories are packed with valuable lessons for other leaders involved in political struggles around the world. As an Anglophone Cameroonian I expected Felix Nkongho Agbor Balla to rise to the occasion after his release and become an inspirational leader in the Anglophone struggle against decades of marginalization and second-class treatment in Cameroon. When he was released I personally expect him to circle the wagons, hold a massive rally and deliver a groundbreaking speech outlining a vision that is in line with the vision of the masses while at the same time adhering to his ideals of nonviolance and tolerance. Despite his failure so far to inspire the masses to follow him after paying a high price for the struggle, I do not think he is a "traitor" as some of his critics and ideological opponents have branded him. He might have a different perspective on the Anglophone struggle but that does not amount to treachery. There is no evidence to suggest that he has colluded with the government to jeopardize the struggle. He has a right to his point of view like everyone else and he should not be persecuted for it. According to a statement he posted on Facebook his father's house was burnt down on 29 October 2017 as a result of his political stance. In addition his father's grave was reportedly desecrated. Such actions amount to intimidation and persecution of a political opponent and should be condemned. Those responsible should be ashamed of themselves and should be brought to book. It is unreasonable and ironic to fight against oppression by oppressing others.